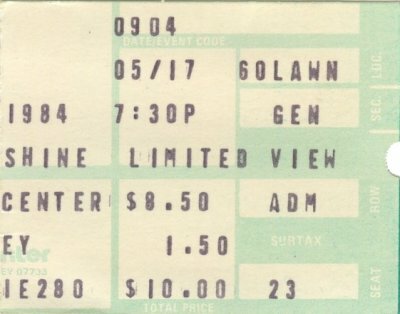 This was my first Yes show, and on my birthday to boot. We had lawn seats and for most of the day pre-show it rained but held off during the show with a few sprinkles as I remember. Great energy and performance by the band but our view was obstructed at times by those in front of us who insisted on standing. They were met with many cries of "Sit the f**k DOWN" by many other attendees. It's great to find this show and finally download it! At the time of the show this open-air venue was called The Garden State Arts Center and not The PNC Bank Arts Center...It was my first Yes concert and it was the day before sophomore year of HS began. Two Warner Brothers cartoons served as opeing act--I believe one of them involved a guy who finds a frog that can sing rag-time songs! A fine performance, but IMHO, a tad "filler-heavy." The proceedings certainly wouldn't have suffered had the ten-minute versions of "City of Love" and "WhiteFish" been extricated. The high point was undoubetedly "Starship Trooper." This was still the era when audiences would hold up cigarette lighters as a show of approbation for the artists, and during the dramatic pause between "Disillusion" and JA chiming in with that "Follow...Follow" chorus, the place lit up like a Christmas tree! If memory serves correctly, the encore reading of "Roudabout" was truncated--the middle section being sacrificed as per the single version--and my friends and I were a bit baffled by the choice of "Gimmie Some Lovin'" as the closing number, but all things considered, this was a rather nice ending to summer vaction. I was on the lawn for this show. I remember cartoons being shown before hand. The Show: I missed Steve Howe, but was impressed with Trevor Rabin. Happy I was seeing Tony Kaye. Disappointed their was not more older material played. My wife during Roundabout said to me; you saw them play this before. Can we leave?". I'm not married to her anymore. It's great to be with you tonight. 'Hold On'. 'Hold On'. Thanks [???]. Thank you very much. I think..uh you thought I was sick over night but as something like that. Are we in New Jersey? I mean..the garden state. As we were driving up. I saw a sign, the Amboys. Do you know you know the Amboys? No ey..no wait a minute. There is, there used to be a group called the Amboy Jukes. I..uh..eh they probably come from the Amboys. As..uh I every night when I'm singing..uh the last song 'Hearts' I kinda think about a little girl and..I just want to mention this because she's here tonight and..uh this next song is for my daughter Jade. She's a little thing. I waved to her too see? Here's a quick one about a magic guitar this really is..uh it can play by itself right and actually it can. Would you like to hear it? Would you like to hear it? Okay, here we go. Woo! Thank you. Thank you so much. Woo! Like to introduce you to two guys in the band. Woo! Get down. This first guy I met a long time ago. Long, long, long time ago. Not too long ago. He's one of the original members of the Yes group. Great keyboard player, great guy. 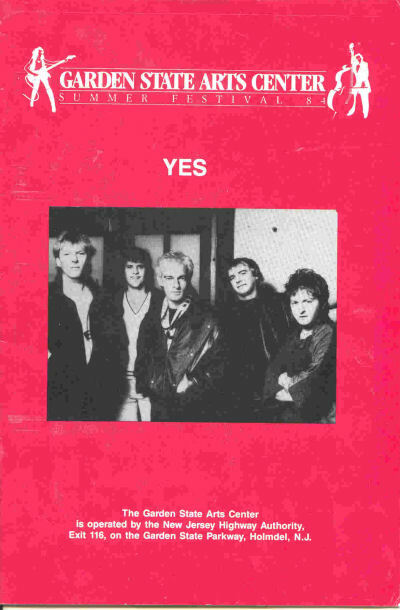 Let's hear it for Mr. Tony Kaye and on acoustic guitar, the latest member of the Yes group. A wonderful guitar player and a very talented songwriter, Mr. Trevor Rabin. Thank you. Woo! Thank you so much. This is a song we recorded about ten years ago. Song is called 'And You And I'. So, so, Woo! Thank you. Thank you so much. Always, always. Plus it's a letter from my mother. She's..she wants to see me. So around the same time we were writing songs like 'And You And I'. 'Cause your searching all the time for songs you know? And then sometimes they came to you rather than you rushing to them you know? They came close to you. Here's one, all you guys in the open air. Whoa. Song's..all right 'cause you can see the open stars I hope. Can you see the stars out there? Whoa. Can you see the moon? It's alright. It's still there. The song is..uh it's for Jennifer. On bass guitar, the doctor, doctor Chris Squire. On drums, electric drums, Mr. Alan white. 'City Of Love'. [Sung as a closing to 'City Of Love'] I want to thank you so much. I want to thank you so much. Thank you for coming to see us. Thank you for coming to see us. It's been great to be with you. It's been great to be with you. It's been great to be with you. It's been great to be with you. Because music and magic, magic magic. Music is good to you. Music good to you. Music good to you. Music good to you. Want to thank you so much. Thank you. Thank you. Star. Like a starship. Like a starship. Like a guardian angel. Like a 'Starship Trooper'. 'Starship Trooper'. Like a 'Starship Trooper'. Sitting on by. Touch my soul.